A Series is a collection of videos known as Episodes. 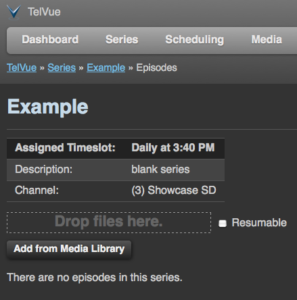 You can syndicate an entire Series through the TelVue Connect Media Exchange. An Affiliate who subscribes to a Syndicated Series will automatically get new episodes as these are added to the Media Exchange by the Syndicator. Duration, in HH:MM:SS. The Administrator determines the margin of tolerance — that is, whether this Series will accept a video that may be a shorter or longer than the assigned time slot. 3. Save, and you have created a Series. But that Series is an empty placeholder until you assign specific videos to that Series as Episodes. 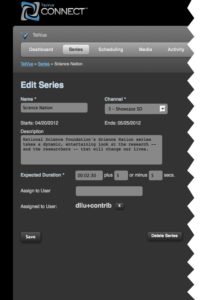 Series can be syndicated by checking off the “Syndicate (share this series)” option in the Edit Series page. In order to syndicate a Series, each individual episode must also be syndicated. 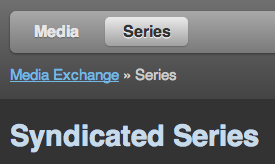 The Series then shows up in the “Series” tab of the Media Exchange. When an Affiliate chooses to license this series, all episodes will show up in their Media Library, and the Series will show up in their Series tab. As new episodes are syndicated, these will automatically be transferred to the Affiliate’s Media Library.